1. 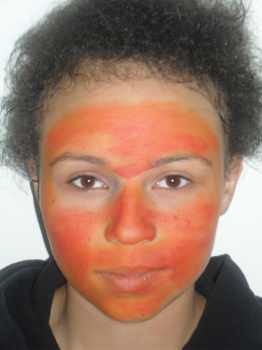 Start by covering the face with a bright orange/red paint mix as in the picture. Then rub the paint in smoothly to get a good coverage. 2. 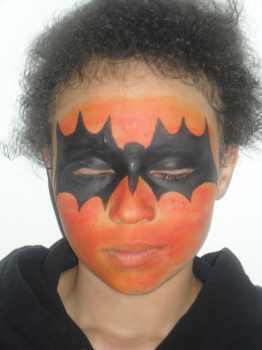 Now using black paint and a medium brush paint the outline of a bat on the face. 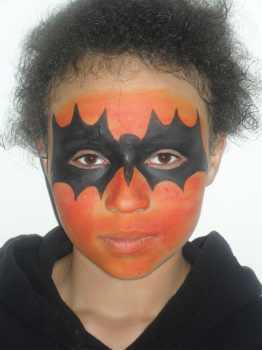 Next using a medium and a thick brush fill in the bat shape. 3. This picture shows how the eye lids are painted black as well. Just take a little more time and care especially with wriggly toddlers. If your looking for more face painting ideas then this video below shows you how to face paint a halloween cat.